This workshop will gather scientists working on the compositional characterization of planets and planet-forming regions in protoplanetary disks. Recent and upcoming advancements make it timely to have a round-table conversation among the several communities involved, to join forces in tackling our most compelling questions on the origins of exoplanet diversity. Do exoplanet compositions retain the imprint of large-scale disk processes? Do disks include compositional trends that imprint on planets? What do we learn in this context from observations of Solar System bodies? And what can we test with observations of disks and exoplanets in the near future? 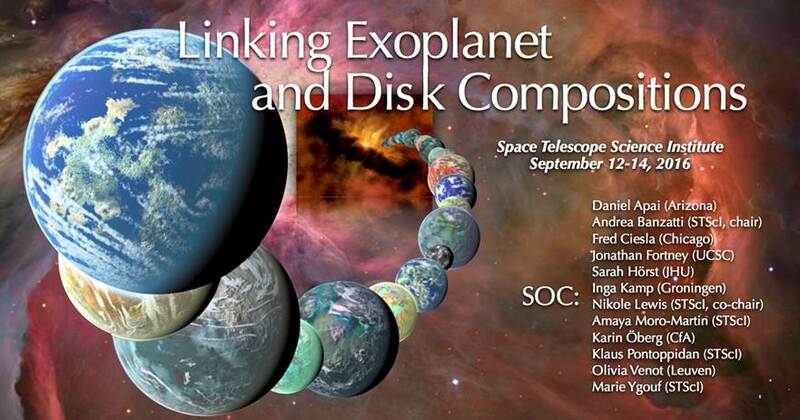 We intend to identify long-lasting and observable links between exoplanet and disk compositions, to help the community in shaping the essential parameter space to cover with existing and upcoming observatories for exoplanet and disk characterization. The afternoon of the last day will offer opportunities to learn more about the new user tools for JWST observation planning and data reduction. The session will include hands-on demos of JWST proposal planning tool (APT), the new Exposure Time Calculator (ETC) and the documentation system. We will also provide an update on the status of the JWST project and the upcoming call for proposals for Early Release Science observations. The fee for registration will be $200. The conference dinner is not covered by the registration fee; however, light breakfasts and break snacks and coffee are. Space permitting, workshop talks are open to astronomers from all local (Maryland and Washington, DC) institutions without registering. However, locals wishing to join us for the conference dinner or to partake in the refreshments, including the poster social, will need to register (and thus pre-register as well). Hotel Information can be found by hovering over the Practical Information and then click hotels.